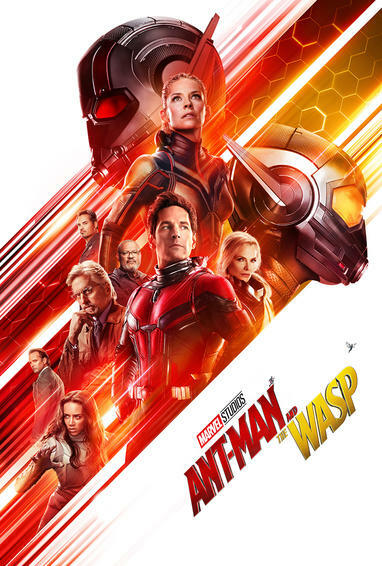 Ant Man and the Wasp is a sequel to the 2015 Marvel film Ant Man and is another hugely entertaining dip into the Marvel Cinematic Universe and a well timed change of pace after the epicness of Avengers: Infinity War. It’s another comedic caper with reformed criminal Scott Lang (Paul Rudd) under house arrest following a plea bargain made after helping Captain America during a fight between the Avengers in Captain America: Civil War (2016). Lang is days away from completing a two year house arrest plea bargain but he risks a long jail term if he breaks the terms of the deal by leaving his house to help Hank Pym (Michael Douglas) and his daughter Hope (Evangeline Lilly) – who becomes the first female superhero to get name billing in a Marvel film as The Wasp. Needs must though, and Pym discovers a way to rescue his wife (and Hope’s mother) Janet – the original Wasp – and must enrol the help of Lang in the risky venture which is complicated by the intervention of mobsters and a mysterious villain called “The Ghost”, seeking to steal Pym’s technology for their own reasons. Lang is helped in his escapades by his friends who have formed a security company – led by Michael Pena as Lang’s hilarious and loyal friend Luis – master of tall tales but given far too little screen time in the latest film but he makes the most of a superb sequence in the film. We could really have done with more of Pena’s ad-libbed lines. As previously mentioned, Ant Man and the Wasp is family entertainment with extra fisticuffs and there’s a strong theme about family responsibility and fathers and daughters but don’t take it too seriously. Paul Rudd is superbly cast as the father who’s trying his best to be a good dad to his daughter while trying to reconcile with his former girlfriend. He really plays well opposite his on-screen daughter Cassie – played by Abby Ryder Fortson. Rudd definitely has the comedy chops to pull off the film while Michael Douglas contrasts well with him as the irascible Hank Pym – but there’s quite a lot of plot in the film – almost to the point where the strands almost don’t come together at the finale. Tragically underserved are Evangeline Lilly as Hope and Michelle Pfeiffer as her mother Janet while were barely given time to appreciate Hannah John-Kamen as Ghost after a great build-up and good visual effects – as an antagonist she felt wasted in the role. Either way, this film is fun while it lasts but ultimately forgettable although it works well as a standalone film. Summary: ANT-MAN AND THE WASP is a US sci-fi action adventure in which the two superheroes take on a new foe who is determined to steal their technology. This entry was posted in Shooting The Breeze and tagged Ant Man and the Wasp. Bookmark the permalink.